As an independently owned dealership, we have carefully selected our manufacturing partner in order to provide you with the best overall product and service options. Our partner Konica Minolta is a world leader in research and development of office technology and solutions. Our manufacturer partner Konica Minolta consistently earns the highest ratings in both user surveys and independent analysis. Today’s multifunction printers (MFP’s) do much more than just make copies; they are complete communication systems. Consolidate copying, printing, scanning, and even faxing into a single cost-saving device. Our trained account representatives can help you choose between dozens of options so that your professional system is exactly what you need to enhance your organization. 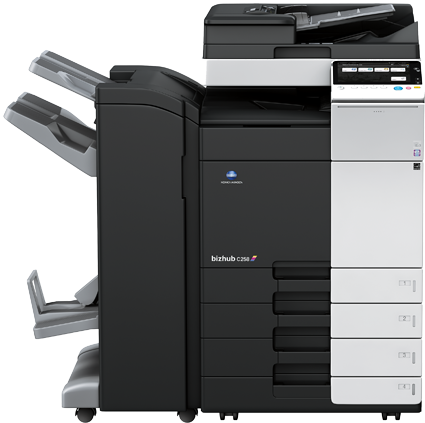 Konica Minolta’s award-winning bizhub office multifunction printers (MFPs) offer cost-effective, high-performance, high-value document management solutions for any organization. The bizhub office product line delivers a broad range of print, copy, scan, and fax speeds with advanced finishing options. Color MFPs feature security options that can be customized for the specific needs of your business. Max Paper Size: 11" x 17"
Max Paper Size: 12" x 18"
With their compact and cost-effective design, black and white multifunction printers from Konica Minolta deliver high-speed output, low-cost operation, and all-in-one functionality for small to mid-sized organizations. Highly versatile devices, these bizhub multifunction printers can be configured with a number of modular finishing options – sorting and grouping, stapling, two and three hole punching, and saddle-stitch booklet making – to fit your organizations needs.